In a new report, Highway Boondoggles 2, U.S. PIRG and the Frontier Group profile the most wasteful highway projects that state DOTs are building. Today we look at an expansion of I-77 in North Carolina that circumvented the normal project selection process thanks to a dubious financing plan. A $637 million highway project that doesn’t merit funding through North Carolina’s normal transportation prioritization process is moving forward in part because a private company is willing to contribute some money — but taxpayers are still going to have to put up hundreds of millions of dollars. I-77 has a carpool lane running in each direction from the I-277 spur into Uptown Charlotte, and extending 26 miles north to Mooresville. The state Department of Transportation has a plan to convert those carpool lanes into tolled express lanes that would be available for solo drivers while remaining free for carpoolers. These are sometimes called HOT (High Occupancy/Tolled) lanes. 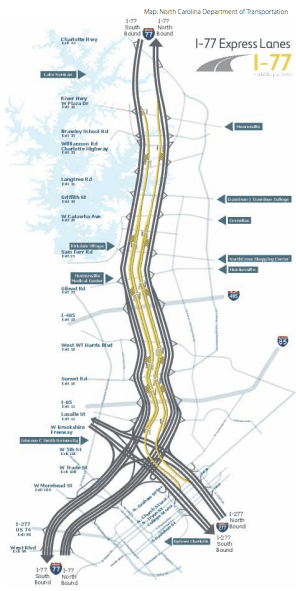 The proposal would also widen the highway between Charlotte and Cornelius (exit 28), where an additional express lane would be built in each direction. Between exits 28 and 36, the single converted carpool lane would be the only express lane. There would be no charge for buses, motorcyclists, or cars with three or more occupants (including the driver), but beyond that, tolls would be set by the private contractor and would vary based on times of day. Early proposals suggest a round-trip journey between Mooresville and Charlotte during peak hours could cost as much as $10 each way. That amount could double (in constant dollars) by 2035, according to project documents. Total toll payments are expected to be $13 billion over the life of the state’s 50-year contract with the company, according to documents. In 2014, the project scored low when assessed according to state criteria governing transportation project investments, the NCDOT’s chief deputy secretary told local officials in May 2015. There are so many projects ahead of it on the priority list that the department didn’t anticipate the express lanes would be funded for at least 20 years. The state did not want to wait that long, so it has constructed a complex set of taxpayer subsidies to cover nearly two-thirds of the project’s cost. NCDOT is putting up $95 million. A loan under the federal Transportation Infrastructure Finance and Innovation Act (TIFIA) will provide $189 million, and $100 million would come from private activity bonds issued by the North Carolina Local Government Commission. That financing package, backed by 50 years of expected revenue from tolls, and up to $75 million in additional NCDOT funding if the tolls don’t generate enough money, has been rated one step above “junk” by the bond-rating agency Fitch. The company chosen to build and maintain the highway for 50 years is called Mobility Partners, a subsidiary of Cintra, a major international construction firm. The 50-year contract between NCDOT and Mobility Partners hamstrings public planning efforts by requiring the state to compensate Mobility Partners for any projected revenue losses that might result from other transportation improvements in the region. Projects that could divert traffic away from the toll lanes, such as adding additional free road lanes or expanding transit service, would trigger the state’s penalty payments. That requirement, as well as lack of transparency surrounding the deal in general, has led to significant public outcry, including by local officials and government bodies. County and municipal officials along the highway’s route have passed resolutions questioning the project and asking that it at least be delayed. Surprising many local residents, Cintra began construction in mid-November 2015, though state and local officials were still debating whether to approve or oppose the project. Will NCDOT Break the Bank on an 8-Lane Highway Through Asheville? Magical thinking about congestion makes this one of the top highway boondoggles in the country.